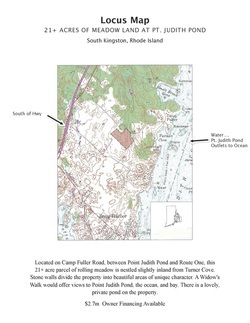 Ocean Haven Estate is an exceptional parcel of prime land along the southern coast of Rhode Island, South of Route 1, by the western shore of Point Judith Pond. This land was once part of Bayfield Farms. It is only a five minute drive to the Pt. Judith Marina and three other Marinas on Pt. Judith Pond which outlets to Block Island sound and the ocean!